Lion Leader applications are now open! Students can pick up an application in the Office of First-Year Programs (LARC 346) Monday – Thursday from 8 a.m. – 7 p.m. or Fridays from 8 a.m. – 5 p.m.; all submissions are due by April 12 at 5 p.m. Lion Leaders help orient new students to the Lindenwood University community by serving as mentors, facilitators, and campus ambassadors. We invite you to become a part of this elite team by becoming a Lion Leader. Apply today! Think you'd like to become a Lion Leader? Review our Lion Leader Description Page below to learn more. 1.) Complete the Lion Leader Application. Stop by First-Year Programs (Library and Academic Resources Center, Suite 346). 2.) Ask one faculty or staff member to serve as a reference. The reference contact form can be found with the application and must be returned with the rest of the application. All new Lion Leader applicants must interview with FYP staff during the month of April. Interviews will be in twenty minute increments and will be scheduled via the application form. Missed interviews will not be rescheduled. 4.) Ensure availability for the entirety of Welcome to the Pride (New Student Orientation). Lion Leaders are required to work all of the scheduled times! You must be available during the days and projected times of New Student Orientation in order to be a Lion Leader. 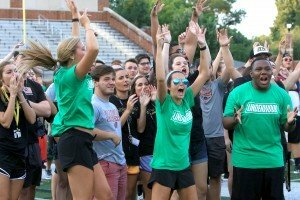 At Lindenwood University, we view Peer Leaders as our ambassadors, representing the University to students and their families.